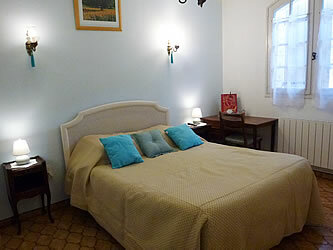 The 2 guestrooms are equipped with a double bed, air conditioning and television. The bathroom with shower and tub and the toilet are shared by both bedrooms. Breakfast is served on the terrace on sunny days or in the dining room. You will enjoy our local jams, made with regional fruits, fresh breads, cereals and pastries. We do not provide lunch or dinner but we can order pizza and advise you on nearby restaurants. Refrigerator and storage space for coolers are available. You can eat your meals on the terrace or in the dining room by the fireplace during winter. tourist tax extra: 0,61 €/day/pers. Between May 1st and September 30, minimum stay of 2 nights during weekends.